Help Moozie's Meet its Go Fund Me Goal! 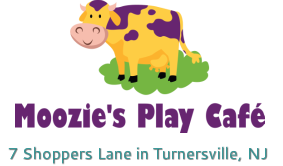 Our primary goal at Moozie's Play Cafe is to provide our community with a fun, clean and safe play space. As a small, local business, we do not have the backing of a major corporation when upgrades are needed. With that being said, we are looking to raise money to celebrate our 3rd birthday to help offset the cost of doing some much needed upgrades and repairs to our facility and play spaces. This includes, replacing the monkey bars on our playset with a safer crawl-through tunnel option, more gradual climbing steps for toddlers to easily climb the playset and other additional gym equipment. Your support all year long means the world to us, and your financial support during this campaign means we will be able to continue to provide you and your little ones with a fun place to play, learn and have a blast! Get "I <3 Moozie’s” Bracelet. Get a Custom Moozie’s Sweatshirt and a Family Invitation to the Unveiling Party in May! Get a One Month Membership of Unlimited Open Play and a Family Invitation to the Unveiling Party in May. Pre-registration is not required for regular open play. You do not need to be a member to enjoy Moozie's Open Play time. Displays all our available Classes, Camps, Special Events and Open Play Hours. Click on any item for more information and to sign up! future months to see what's coming up. Check availability and reserve your date and time right online, simply click on the Check Availability button of our Birthday Page. Join Moozie's Email Club or Like us on Facebook!